MARCOM's "Personal Protective Equipment" Compliance Manual has been created to help facilities comply with OSHA's Personal Protective Equipment (PPE) Standards (29 CFR 1910.132,133, 134,135,136,137,138). The manual reviews the regulations and their compliance requirements, and contains a complete "fill-in-the-blank" written PPE Program. "On-the-job" injuries affect all types of people, doing all types of work. Each year hundreds of thousands of workers are injured... at a cost to employers of billions of dollars annually. Studies show that the majority of workplace injuries could be avoided if employees used the proper Personal Protective Equipment. Yet many people have little idea of what protective equipment should be used in their jobs, or how to use it properly. 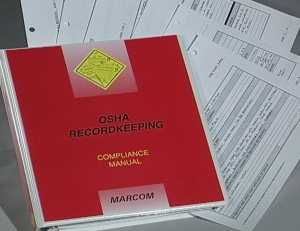 Areas covered in the Manual include the history and background of the regulations, copies of the standards, major compliance requirements, an overview of PPE categories, a "fill-in-the-blank" written Personal Protective Equipment Program, forms and procedures, a glossary of terms, and more! By filling in the blanks in the written "Personal Protective Equipment Program" section, any facility can create a complete program that will help them meet the Standards' requirements.